What fuels my life is being around likeminded women who support me in figuring out who I am. So it was only a couple of months ago when I had gone to visit my publisher in New York that I stole two hours for myself to venture out and see great art. And Voila! 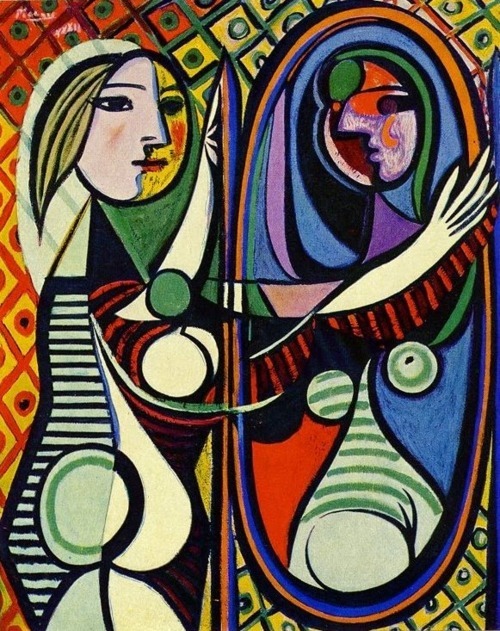 This is what you get: Woman in the Mirror, by Picasso. There is so much to say about this image that captivated me. How many times have we are the culprits that limit our own growth? When I first wanted to write a book, all of these negative and fearful thoughts came to my mind —Why would anybody be interested in what I have to say? How dare I change my work from being a psychology professor to becoming a writer! It’s too late. How can I manage the workload with my family’s needs? I’m too old. Am I going through a midlife crisis?—You can just imagine the laundry list of all the reasons I came up with. “We don’t see things as they are, we see them as we are” — Anais Nin. As we go through life’s journey, we stumble upon ourselves over and over again —our deepest desires, the important relationships in our lives, our career choices, strengths and limitations, force us to reexamine who we are and where we are heading. Our life is seldom a straight path, but rather a series of unfolding takings and turnings. Do we check in with ourselves to see if we are headed in the right direction? In the hopes of creating meaningful dialogue for us women who are embracing the journey, I will be posting thoughts, discoveries and topics that may interest you. But most importantly, I would like to create a forum where we inspire one another to experiencing greater and deeper lives. Just remember, re-visioning ourselves does not require us to tear down all that we have worked for, but to refocus our energies on what invigorates us most. Here is a great quote to think about “A little change is all it takes to make a big difference,” —Editor at O, Magazine.